It is fashionable to advocate using the Fourth Estate (=the Media) to monitor the government. This leads to a meta-problem: So who is going to monitor the media? So it was that I found myself in such a situation. By habit, I am used to reading Next Weekly in Hong Kong. This is the weekly tabloid with the largest circulation and therefore presumably most influential with respect to public ideas and opinions. There are many tabloid weeklies in Hong Kong and how many can I read? So that is the one that I follow. This week, I picked up East Week as well, because the cover story was about Ching Cheong. Inside East Week, I found that they have dedicated themselves to monitoring their major competitor Next Weekly. I learned a few things that I wouldn't have known otherwise. After all, Next Weekly is the market leader and would never deem to respond to anyone's criticisms, just as the New York Times would never respond to bloggers. Anyway, East Week pointed out two major stories in Next Weekly that I had reported without any inkling about potential problems. So here are the de-mythologizing of those two stories. There is a new freely distributed newspaper named Headline News in Hong Kong. This week's Next Weekly magazine showed how where some of its copies went. 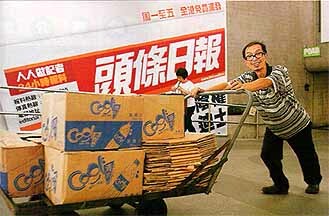 The sequence of photos showed a man helping himself to the stacks of Headline News in Hong Kong Central by loading batches of them onto his handcart. In the next photo, the man looked quite happy as he left with his collection. Where was he going? Right to the garbage recycling center where he will sell the newspapers. The man complained to the reporter that this was very hard work, because he'll only make about a dozen Hong Kong dollars for his efforts. Unfortunately, used newspapers are only worth the paper that they are printed on, and that isn't much. [translation] After Next Weekly published that article about the difficulties of distribution for Headline News plus the fact that the garbage scavenger at Star Ferry was just hauling off stacks of the newspaper to sell, Headline News sent a reporter to the scene and found the man in the photo. The reporter observed the man discretely and saw that he only took out the copies that were thrown in the garbage can; at no time did the man touch the whole stack of undistributed Headline News. Eventually, the Headline News reporter spoke to the man and found out that several days ago, he was foraging in the garbage can as usual. At that point, a young woman approached him and said that she was sympathetic with the hardships faced by garbage scavengers and suggested that he could just pick up the stack of undistributed Headline News. She hinted that he could take them while the distributors were not watching. He found out later that she was a reporter, and there probably was a photographer hiding somewhere to take his photo after he took her advice. He said angrily: "She wanted to create news. What can I do, since I have neither money nor power?" Of course, at this point, I am shaken up enough to wonder if the Headline News reporter was telling the truth. The only way that I'll know is to go down to Star Ferry and talk to the man myself. Well, East Week proceeded to ask the Police Commissioner of Hong Kong Lee Ming-kwai about the authenticity of this map. The response: "It is obviously fake! How could we be so crude? How could we even misspell the names of the places and streets?" (Note: For example, the Ranaissance hotel is obviously the Renaissance; Steward Road should be Stewart Road; etc). Another senior police officer also pointed out three major errors: First, the scale is listed as 1:5000, which meant that the length of Harbour Road along the first stage of the Convention Centre and the two hotels would be 740 meters when it is only 348 meters long for an error of more than 100%. Second, the map lists four demonstration areas whereas the police has not made any decisions at this time. Third, the map was hand-drawn whereas every time the police has to plan a large action, they will use digitized maps for accuracy. 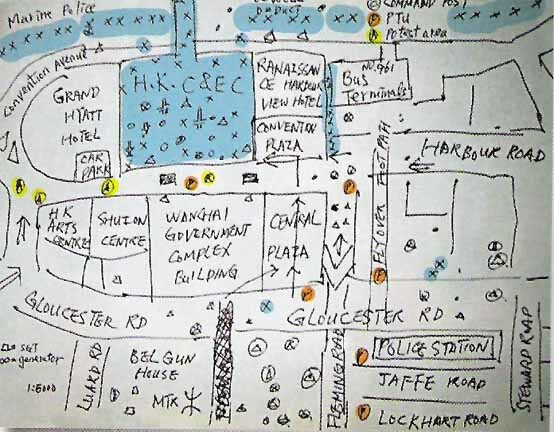 It is speculated that Next Weekly found this hand-drawn map on an Internet bulletin board system sketched by a netizen and then used it as the official police plan. The senior police officer said, "The media are so unprofessional. Couldn't they even check with us before they report it as being accurate?" Now, will I ever trust anyone?